"Delicious pull-apart sliders, perfect for a party. Quick and easy!" Place the roll bottoms on a baking sheet. 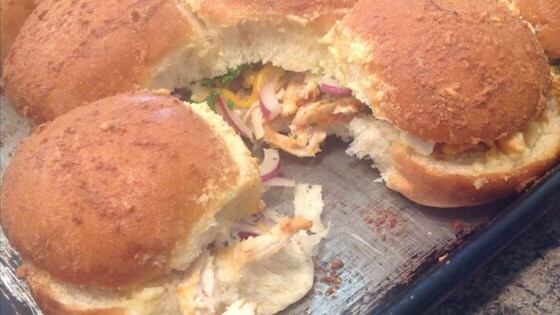 Divide chicken, Cheddar cheese, barbeque sauce, onion, and parsley equally over the rolls. Cover with roll tops; brush with melted butter. Sprinkle Parmesan cheese and garlic on top. Bake in the preheated oven until golden brown and cheese is melted, about 20 minutes. Slice and serve. Tender shredded chicken sliders with BBQ sauce! Hawaiian sweet rolls can be substituted for the dinner rolls. Use any of your favorite cheese instead of Cheddar if desired. This recipe was a huge hit with my kids. I did not make any changes to the recipe but would add a little more BBQ sauce next time I make it. Definitely a keeper! I sautéed the raw onions in butter first. Other than that, I made no changes. Great and quick to put together. Yum! Good! Easy and warm on a cold day! Family liked this. Next time, I would increase the chicken a bit. Probably cut down on the parmesan cheese/garlic topping. Also, needs more bbq sauce. But overall, a good dish.